Mobility! 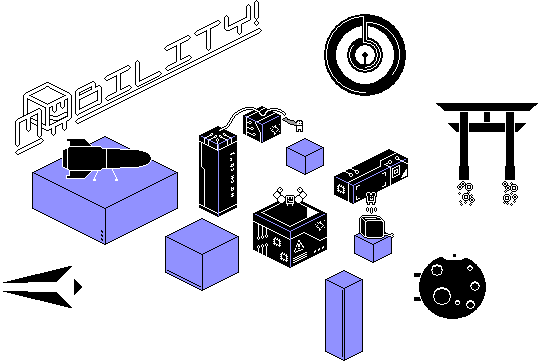 The accessible precision platformer - OUT NOW! In Mobility, every platform is a switch you activate upon contact. The goal in each level is to activate all platforms, making each level a little puzzle, especially when you're attempting to score a new record. In the story, these rooms are engine rooms on spaceships that you (a repairman in training) has to fix. I made this game over two years, in my free time during my game design study. While I am not charging for this game, if you enjoy it consider voting with your wallet to support me with making more games in the future. Mobility! was released on the 17th of February, 2018. You can play it here. What follows below is the original first post of this thread, put online on the 25th of February, 2016. Mobility! combines the super tight controls of Super Meat Boy with the extensive moveset of the 3D Mario games. The goal is to touch every platform on the level once by either landing or walking on it, or sliding down from its side. The game aims to provide a fun experience to new players of the genre by it's inclusion of multiple difficulties and checkpoints, and tries to satisfy the profs with a solid competitive experience with replays, leaderboards (WIP) and secret super difficult levels (WIP). The levels will be accessible via a mini hub which doubles as a training ground and will hide some secrets of its own. This GIF shows a level that flows very well, but I'm also planning levels that require more routing to achieve the best time. Updates on this 'log will mostly focus on game design, with an occasional extra topic every now or then. I'm trying to update it every week or so. Mobility! is developed using Game Maker Studio, by Tom 'Auroriax' H. (@AmazingcookieNL) and a very large amount of apple juice. 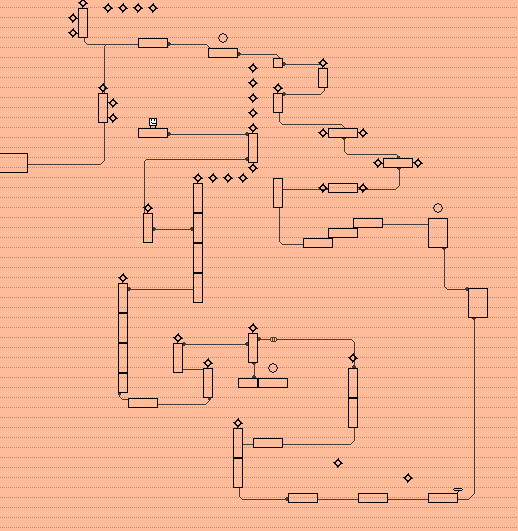 Been working on a new level which uses the plasma conveyors (mid-air conveyor belts!) heavily. I'm quite happy with the result! Tons of bugfixing today. Moving platforms are always difficult to get entirely glitchless in a platforming game. And if you get hit with a spike, if you hit a block while the level transition was playing, the blocks you would hit would still get colored in. Have I told you about our reset level button? In most time trial focused games, you have two keys to quickly reset the level. One is restarting from the last checkpoint, and one is for restarting the entire level and the timer. Personally, I often mix these up. If I'm used to quickly running levels, for which I often do a full reset if I make even the slightest mistake, when running a harder level I often press level reset instead of checkpoint reset, which prompts me to restart the level with no undo. So in Mobility I came to the solution that pressing [R] resets to the checkpoint, and holding [R] for ~0.3 seconds resets the level. This works quite well, actually, and solves the problem for the most part. Unidrax (see last post, he's building some levels for Mobility! currently) saw the names I had given the levels so far (Vertigo, Xenon, Gold), and that inspired him to translate random words into Latin and use those as level names. This already generated some awesome names like Ostium ('door') and Magna ('big'). He comes with crazy ideas like this all the time but it's the most genius when it actually works out. And if you beat your current best time, your now-previous highscore gets crossed through! Now, the level flow is much clearer overall. You can see where you are intended to go next, and the cables lead you past all blocks on the stage. 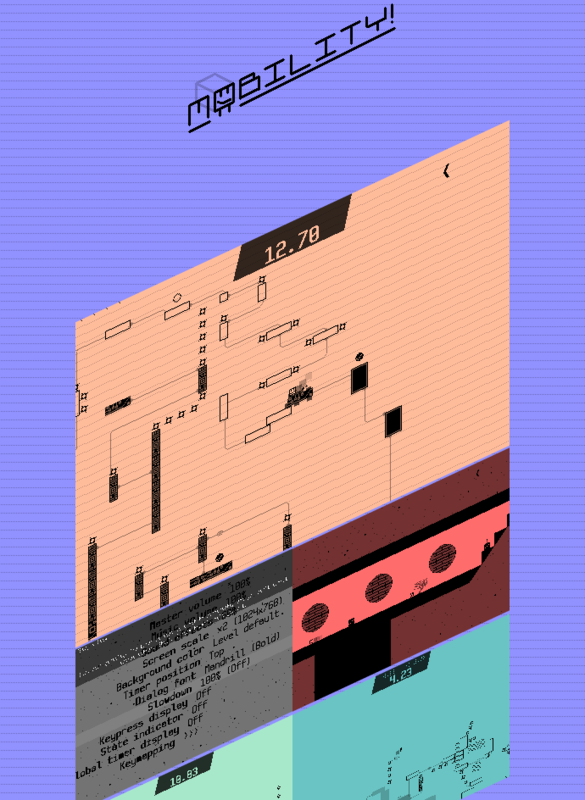 The winning condition of the game is touching all blocks in the level. If the goal was placed on the leftmost platform in the above screenshot, the player could've simply backflipped past the spikes left from the start position, using an unintended shorter path. (In speedrunning jargon this is called skipping.) So if competive races where done on these levels, it would be about traversing the intended path the fastest, instead of trying to do a frame-perfect (speedrunning term for near perfect timing required) trick to skip half of the course, the very winning condition closes that possibility. It might still be possible from time to time, but all major skips are closed this way. 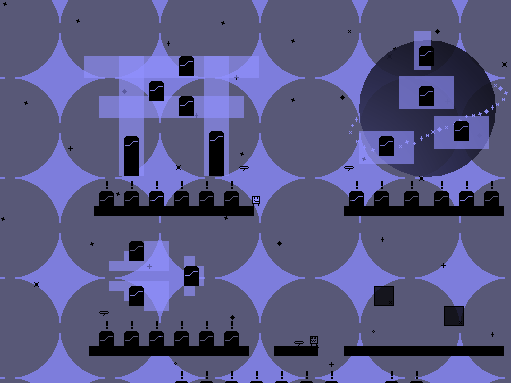 This level is more open, and also contains some moving threats (the floating spikes will actually start to move as soon as the level starts). So you'll need to plan a route ahead of time to get the fastest time on these kinda stages. This level also plays incredibly different on all three difficulties, more so than the parcour-type levels. I should talk a bit about the differences between difficulties. The goal of each level is to touch all blocks on it, as fast as you can. Normal difficulty is the difficulty the game has been designed around, where you can walk or slide from the block's sides to activate it (but not from below, like you would do in Mario games). The easy difficulty puts a radius around each block, which you must enter to activate. 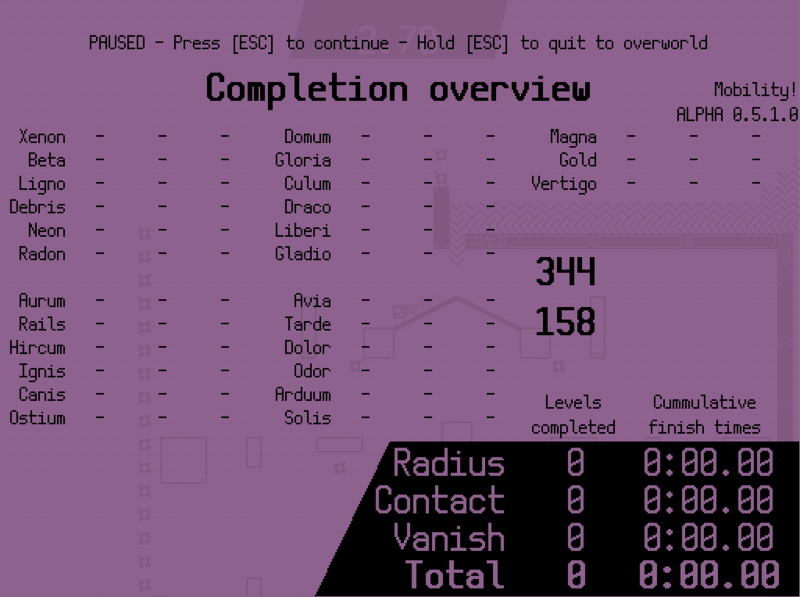 That radius grows each failed attempt, so less experienced players can never be get stuck on a level. On the hard difficulty, blocks disappear soon after being activated. While you can rest on the block you've just activated (the block will not disappear as long as you're still standing on it), it generally means you have to haste. In addition to that, all checkpoints are disabled, and while each level is about 20 seconds long, it still means you'll have a tough time. The difficulty selection appears before you enter a stage, so difficulty can be selected on a case-by-case basis. While you mightn't know yet which difficulty you want before you enter, you can change it by simply exiting the level. It's much better than a game where you are asked to set the difficulty before you know how difficult the game actually is, and can't change the difficulty later on if you change your mind later. These multiple difficulties are also intended to make the game more accessable for everyone. Some good progress since last time. Today we decided on some story and overworld criteria. 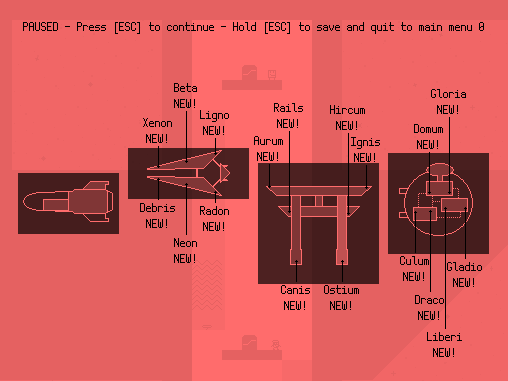 The player character is training to become a spaceship repairer. 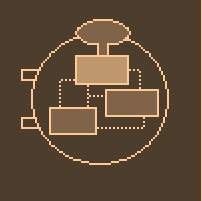 As such, the overworld consists of multiple spaceships, which you can travel towards per teleporter once it's unlocked. The room the player currently is in, has a brighter color than the rest. On the map you can also place notes that indicate you can access a certain level there, and it'll fetch that level's name and highscores. 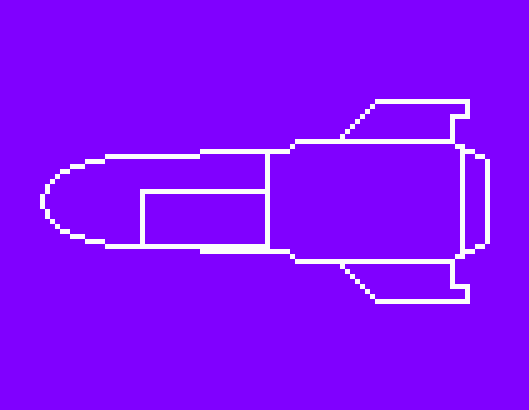 The second ships' design was done by Unidrax, which sent me this ship design which I then redid in the game's single-color style. Yesterday I worked on a way to store a replay as a saveable file. The goal is to use the GameJolt API to upload these replays with the scores to the leaderboards. As such, I am especially watchful for ways to reduce the file size of these replays to make uploading them as smooth as possible. This is how replays work in Mobility: Once the players hits a button, the timer will start running and the playthrough will be recorded. During the level, an array is updated each step/frame with the buttons that register presses. If the player reaches the finish, the game restarts the level and starts the replay, and will repeat all button presses the player made. The game is re-enacting the playthrough. The big upside of this replay system: very low file sizes. The game records the state of five buttons, so for the length of the replay, that theoretically means five bits (or rounded up to one bit) for each recorded frame is enough. The downside is that the replay could desync, not be identical to the original play anymore, if the game logic during the replay is handled differently somewhere in the game. Even a single desync could quickly ruin the replay. Today I've been hard at work minimizing the possibility of desyncs. To submit the replay to the GameJolt API, it needs to be formatted as a string, but the replays are recorded in-game as an array. So we need both a script to turn that replay array into a string, as well as translate it back to an array. - It adds the new character at the end of the current replay string. It does these steps for as long as the replay array is. If you want to get an array out of the replay string, you just do these steps in reverse: take a character from the string, find out which value that character represents and set that value, and from that value, figure out which buttons should be pressed on this frame. Next up, I'm going to look into a way to reduce the file size of that string. Right now, the amount of frames in a replay equals the amount of bytes. I'm sure I can get that smaller somehow. Okay, so I managed to reduce the data size by about 40%. If two of the same characters appear after each other, it'll replace it by one character, but capitalize it. Since this data needs to be uploaded as a string anyway, this only reduces the data size as a result. I think optimizing things like this, packaging the same info in less data, is a super nice puzzle to figure out. I did something similar to Mobility's replays in the Box Kickers X's level editor, trying how to save what is an array in-game as a save-able string. In the meanwhile I'm having another little dilemma. I even stepped in at the Indie Dev Hour for opinions. As listed before, the game has multiple difficulty levels, Easy, Normal, and Hard. Normal is the experience the game is designed around. 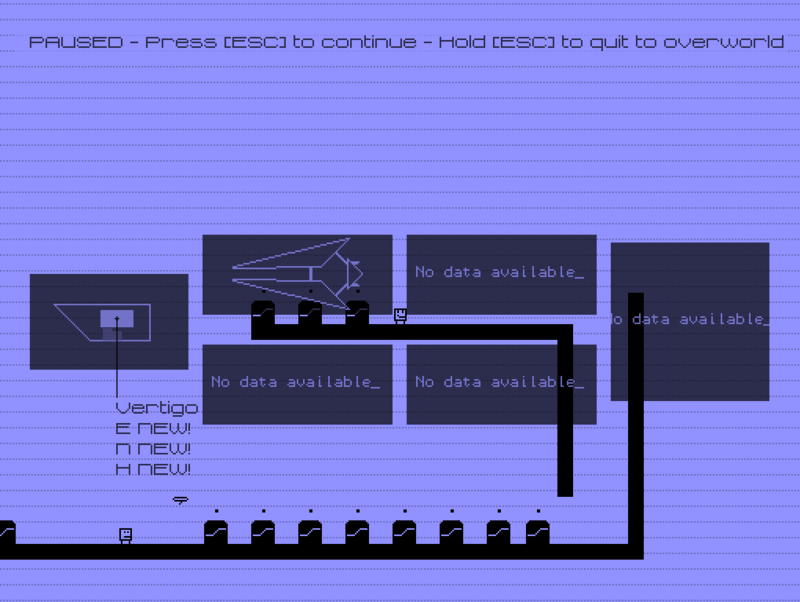 Easy simplifies it by making it easier to activate the platforms, and makes this even simpler if the player is having trouble. Hard is the opposite, all checkpoints are removed and platforms appear shortly after they are used by the player, and is severely more punishing. Another earlier post in this dev log describes it in greater detail, but this is enough to understand my problem. The problem is the naming convention. Hard should actually be called something like 'punishing', since it actually steps up the difficulty by quite a bit from Normal. Meanwhile, Easy should have a label like 'Beginner', but it mustn't make the player feel that he is a beginner (or 'noob'), but making him free to use it if it doesn't work the normal way (some people have that tendency against handicaps, accessibility features, or Nintendo's Super Guide). 'Normal' indicates that it's the intended experience, so that name is quite okay, unless I find something better. It might seen as a little detail, but it's quite fun to find a solution for it and the final product will definitely be better thanks to all these small design thingies. I'll let you know if I figure out some good names. One of my fave indie game developers Two Tribes announced that they're shutting down after the release of their final game RIVE this September. Kudos to them for being one of the reasons I got into playing indie games in the first place. For names of the difficulty, for Easy I'll pick 'Relaxed' or 'Chill'. This indicates that it is a more relaxed or less taxing way of playing, while not necessarily indicating it's easier, although that can be derived from the name. Most likely it'll be accompanied by the byline 'For everyone!'. 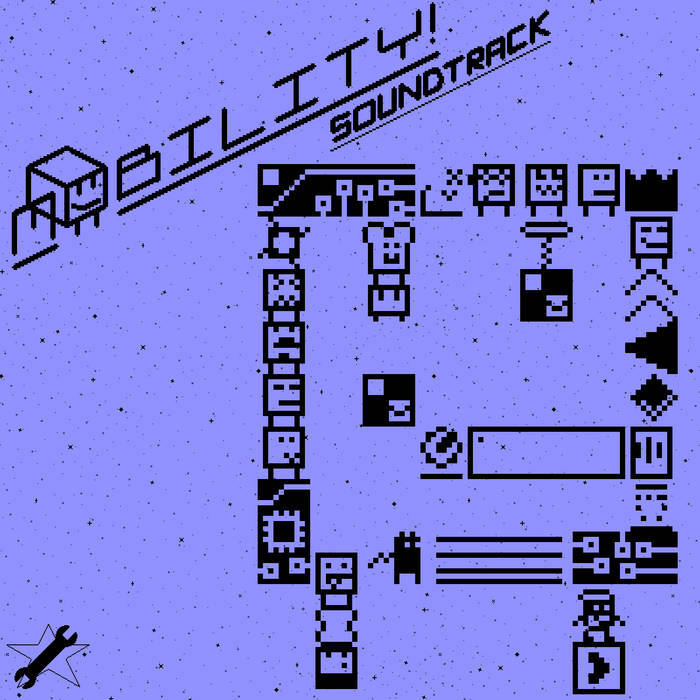 For Hard, I'm thinking of using the name of the game ('Mobility!') as the highest difficulty name. This is a thing done often done for osu! levels where the highest difficulty level name is a small joke that relates to the song or song name. And accompanied by the tagline 'No mercy. ', this will draw in the good players while keeping the others away from a punishing experience. In the meanwhile, my level design partner is making sure my bug fixing list stays filled. Unidrax messes around a bit and before you know it your buglist is one addition richer. It's a gifted ability of him. Today, he found out that if you hold a button and then unfocus the window, the game never registers that button being released and keeps thinking you've pressed it. We use Gyazo to quickly record and share bugs. After that I throw it on the list, and will keep it in the back of my mind when working on the game. It's never a bad idea to have (someone else) thoroughly bug test your game. Slow progress last week. My partner was busy with a test week, so I figured I would work on my other project, a Sokoban-inspired puzzle game, which seems to be nearing completion. Talking about that seems out of scope for this 'log, but it's coming along nicely, although each individual puzzle takes a lot of effort to create. The only new additions in Mobility apart from bugfixes were new levels, of which I'd be glad to share a GIF from. I'm starting work on the overworld. It needs to be a good place to practice, not too big or difficult so it's easy to get from A to B, and act as a breather for the difficult levels scattered across the map. Here's the dialog system. It automatically adjusts it's height depending on how big the text inside it is, which is a huge boon. Furthermore, the text is quite big, the text has shadow while to box itself is slightly transparent, which all goes into making it look cool and minimalistic. I'm planning to scatter a few of these talkative spaceship employees to give the player tips or just start some small talk. Just finished fixing all the desyncs in the replays. It's actually pretty tough to find out what exactly is the reason the replay is not equal to the played game. As explained above, the game records which buttons where pressed on each frame, and 're-enacts' the playthrough. Often a desync is caused by values being overwritten or the key pressed of a single step before. I've been struggling with this for some time now so it's good to have this out of the way. Spent most of the past and this week working on a Picross/Nonogram client, but it's code turned out to become so incredibly messy and buggy that it's simply no more fun to implement features into it (alongside other factors). So I hope to pick up speed with Mobility again, although I have a hard time deciding what needs to be implemented first. I'm thinking of working towards a playable demo with a part of the game all wrapped up, and use it to test and gather some feedback to shape the rest of the game. I'll see. I don't know how I haven't seen this before, this looks great! So I've been working on support for multiple characters! All characters need to fit 10x10 (or anything else in which a 8x10 collision mask makes sense), which limits it a little, but is probably a neat addition. Maybe I can also give the characters unique abilities but that's something I'll decide further down the line. 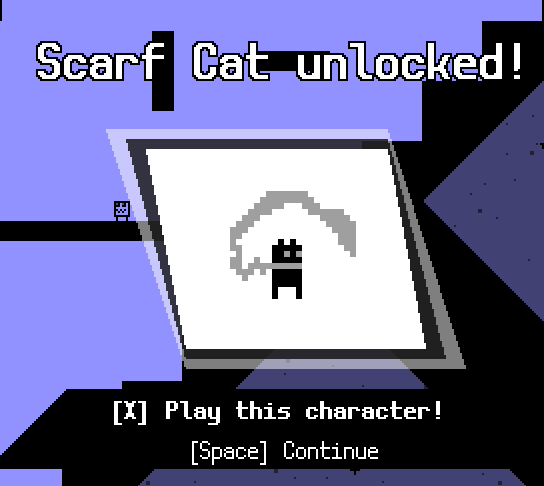 The first extra character to make it in is the Scarf Cat. It's one of the characters from one of my prototypes that never got finished, but I liked the character and recycled it here. 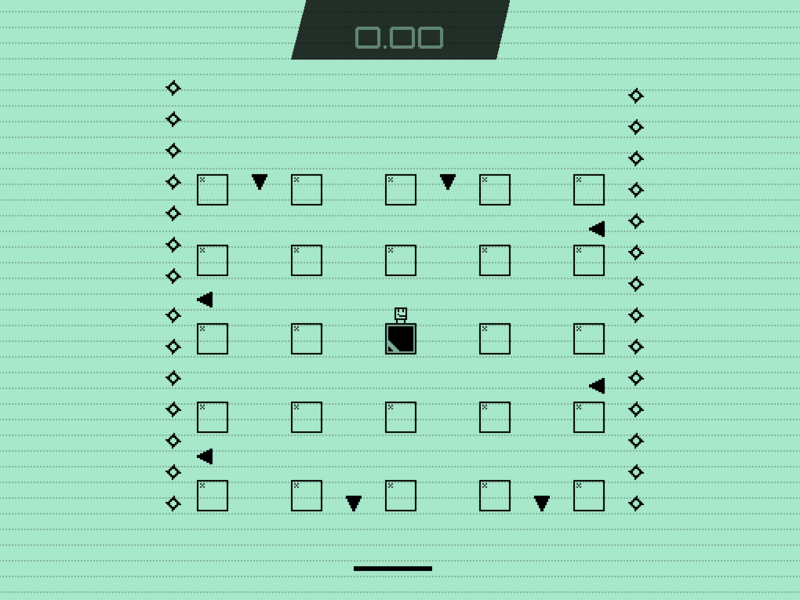 I'll probably put in more characters from my previous games, provided they fit inside the 10x10 limitation... There's one little dude from a game I made three years ago that still regularly makes cameos in my games, which is probably the next one I'll add. 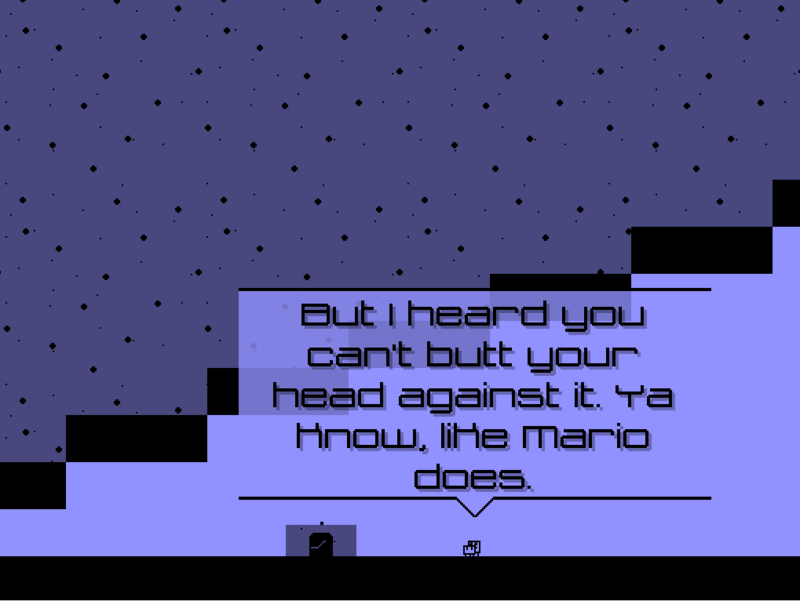 I've also implemented a system to send messages and feedback to me from within the game. This will allow me to gather more comments in case I would publish a demo, but will also be useful in an eventual full launch of the game. The feature was set up surprisingly fast with the GameJolt API and its corresponding Game Maker library. Also working on implementing Sonic-like grind rails. Very tricky to get the momentum for that right, but I'll share a GIF of it as soon as I have the sloped rails working. Showing of the Scarf Cat, as well as the new grinding rails! This new gimmick is quite Sonic the Hedgehog-inspired, but operates on it's own custom set of rules. It's fairly difficult to come up with ideas for gimmicks that aren't feeling too 'gimmicky', and while I feel I've done a good job on this, I definitely want to test it some more. We have also been progressing with the overworld of the first ship, the 'Arrowhead'. I've been making hologram screens showing useless but cool-looking graphs. Unidrax commented on that the 'windows' in the ship looked more like the ship has gaping holes in its hull, so they've been replaced with transparent windows. We've also finished all overworld rooms on the ship. Now, in the levels the camera follows the player perfectly, keeping him in the middle at all times. But on the overworld that makes less sense, in my opinion. This is why the overworld uses a noded camera system: every room in the ship is divided into multiple zones, and once a player is in a zone the camera targets the middle of that zone, and otherwise it targets the player. This camera system has originally been designed for a puzzle platformer (where the camera is kept still when you're in a puzzle room), but a slightly adjusted version of it also works in the Mobility overworld. Since I have a vacation now, I also have the time to pick up some stuff aside of those two. For example, I just released Micro Massive II, which was in a finished state for over a year, but I never found the time to tweak it to the level I wanted it to be. It's not that I didn't wanted to, I just kinda forgot about it in the light of the new games I were working on. Since I have not released any game yet this year, I found it an appropriate time to finally pick it up and put all finishing touches in. If you are interested you can grab it here. Mobility was temporarily put on the backburner so I could focus all my attention on Tahira's Tower, which released just now! As you might know, actually finishing a game takes up a ton of time and effort, making sure everything will really come together in the final game, which is why I chose to make Mobility lower priority for the past month or so to fully focus my efforts on this other game. - Soundtrack switching! This is an idea I coined to the musician I'm working together with (the same dude who I worked with on Tahira's Tower for the music). You see this in games like Fire Emblem Awakening and Guacamelee!, where a different variation of the same track plays based on the situation in the gameplay. I thought it would be a cool idea to switch the track between the overworld and the levels, where a chill version of the track plays on the overworld and is replaced with a more pumping track in the level. I got this working in-game today with some initial tracks, and it works and sounds awesome so far, and would love to show you once I have more finalized music. 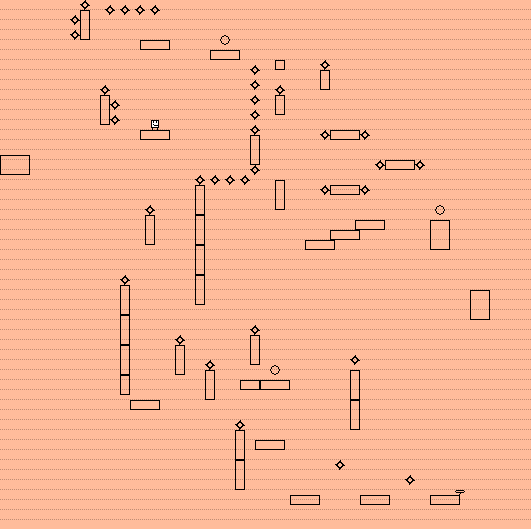 - I'm planning to expand the overworld with some new spaceships. 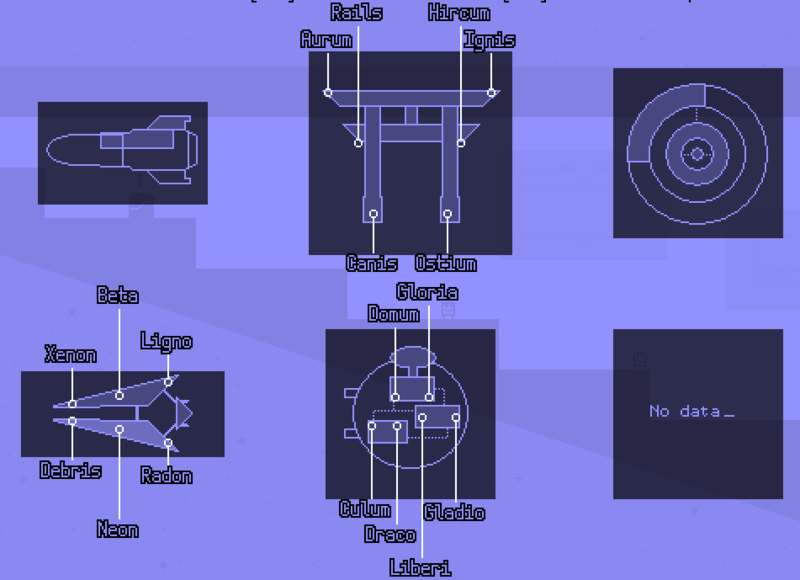 The current idea is that there are multiple spaceships that the player is tasked to repair, and finishing one by beating the boss or some other event, the ship is fixed and next one unlocks. Also more info about this one soon as it's more fleshed out. I'm hoping to get posting here back into my habits by teasing all of this stuff here, so see you again soon! Mostly text today, but here's a little GIF showing off my new particle effect! More about that in a later post, today I'm going to talk about sound effects! This is usually one of the last things I do in my games. Most of the time I settle on BFXR-generated effects, and sometimes my games don't have any sound effects at all. I did it fairly early this time in my attempt to make the game as 'juicy' as possible. For anyone unfamiliar with the term, juiciness indicates to how responsive the game is to your actions. In an attempt to increase juiciness, one could add particle effects, screen shakes, flashes, and other effects. My favorite talk on this subject was given by Jan Willem Nijman, 'The Art of Screenshake', where he presents a very visual examples of the steps he takes to increase responsiveness in Vlambeer's games. The doors in Mobility overworld require two [Down] inputs to enter-- the first one is to open that door, and the second is to pass through it. As such, I wanted a relatively dramatic, sci-fi-y door opening effect, and I managed to find one. Finally, I wanted a cool effect for my room transition. I settled on this 'swoosh' effect. More sound effects could be added later, but this is a pretty good start so far, and at least I broke out of my cycle of shoving the problem of end to development. - Key remapping! This was already available behind the scenes (this is really one of the things you need to do consistently from the start of the project or it requires a lot of code lines to be replaced), but what I still needed was a little menu to change those bindings in a comfy way. I could reuse the setting menu controller here, and after fixing a few problems, it's finally operational. The only problem is that it doesn't support saving yet, but the saving of progress and settings is usually one of the last things I do on a game project, so it's fine for now. A problem is that the game does not uses the mouse in any way. I already made a keymapping interface for one of my previous games, Box Kickers X, where you can click the key you want to remap. In other keyboard-only remapping interfaces, I found it very easy to screw up my controls by doing weird things like mapping [Left] to [Right arrow] and vice verca by accident, to give you an example. There are a few failsafes in my version to prevent most of them, including a 'Reset to default' setting. - Another new particle effect that plays when a block is activated (notice the squares popping out of them). Not really sure about this one yet, it looks cool, but I feel it could be better. - Me and Unidrax are also working on a new spaceship. It's shaped like a Torii (read: a special kind of gate often placed near holy shrines and other sacred locations in Japan), which we gave the punny name Starri. It's interior is WIP and not very fancy yet, so I hope to give you screenshots of it later. - Last but not least, here is a totally new title screen! For now, it's just a comfy way to get to the debug room and game settings quickly, but it's already quite fancy and I'll make sure to make it super fancy later on. That's all for now, folks! For now, I'm planning to fix some bugs, and then get back to design levels and the overworld. Thanks for reading! Just released Sokobanana and my new website two days ago, so I found the chance to get a bunch of Mobility work done yesterday. I think I'm going to put posts related to Mobility's game design mostly on these, and just put cool gifs of things I've done on here so I can update it more often. I also implemented a global timer, that starts at zero when a new game is being played, and ends when the game is beaten. I might expand its functionality later on, but it's already somewhat sufficient for speedrunning. Do you remember the settings menu? I also updated that quite a bit, because the amount of settings available didn't fit on the screen anymore. And the descriptive text has good contrast with the background now. I also implemented a feature that allows me to sort the settings manually, independently of how they're ordered in the code. (That doesn't sound like a big deal, but it makes my work of maintaining the settings menu a lot easier.) There are still a few additions I'd like to make, but I like where it's going. Zelda's finally releasing tomorrow, so I'll make a blog post before I'm occupied playing that. 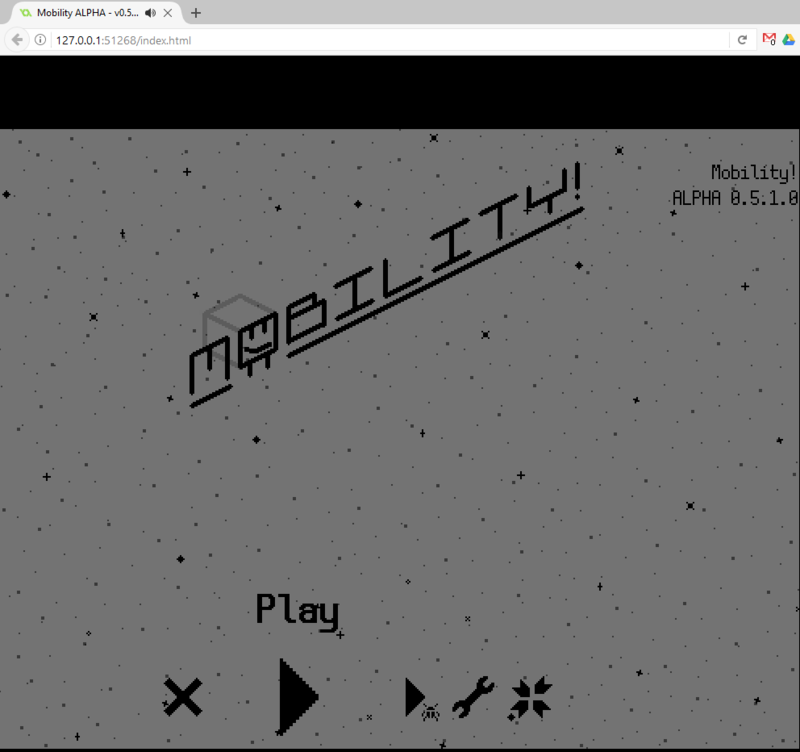 Since last time I made a website for Mobility! It's at http://mobility.auroriax.com. 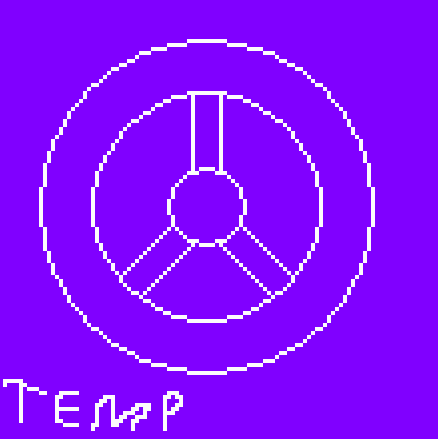 I made a concept for a spaceship that's intended as a hub, which contains the initial training for the game, and via which you can travel to other spaceships. It was originally drawn by Unidrax some time ago but left unused, and we decided to reuse it to replace the bland original design. And remember the draft of the final spaceship from my last post? I polished that up a little, the intention is now to break through the layers of the space station and get to the boss room in the middle. I hope this is a good beginning for a great finale of the game! Also, I redesigned the debug room yesterday. There's a door to every room in the game here, levels and overworld rooms. 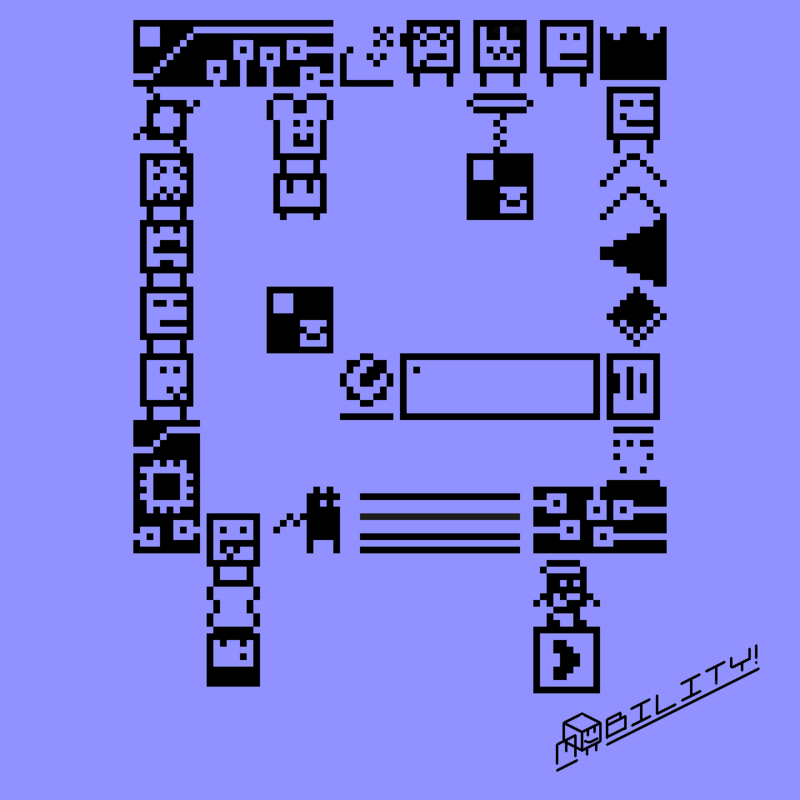 Previously, it had the doors to overworld rooms to the left, and normal levels to the right, but now that access to the levels have been assigned to each overworld room, it was quite messy. Now doors to the levels have been arranged below the ship they can normally be accessed from, and yet unassigned levels are at the bottom of the room. The idea is to split the info over three screens: this one is mostly done but needs some re-positioning of some elements, one will have a full overview of completion throughout the entire game (sort of like the overview in modern Mario games) and one with information like the ship's background story and game controls. More about that next time, though! Getting Mobility working in a browser has always been a bit of a stretch goal for me. I use Game Maker Studio, but the code the HTML5 compiler generates is really hard to debug, and error messages are really hard to make sense of. Usually it just then boils down to which objects are in the room, removing those until I find the one that causes it to break, and then removing/commenting scripts on that object until things no longer break. But in my last attempt, I pushed through instead of giving up. The previously game-breaking bug seemed unsolvable during my previous attempts, but it was really just a few lines of script messing it up. So I finally managed to get it to work. The goal was a completion overview like available in modern Mario games, where you can easily see everything you've done up to this point, and anything you might have missed. 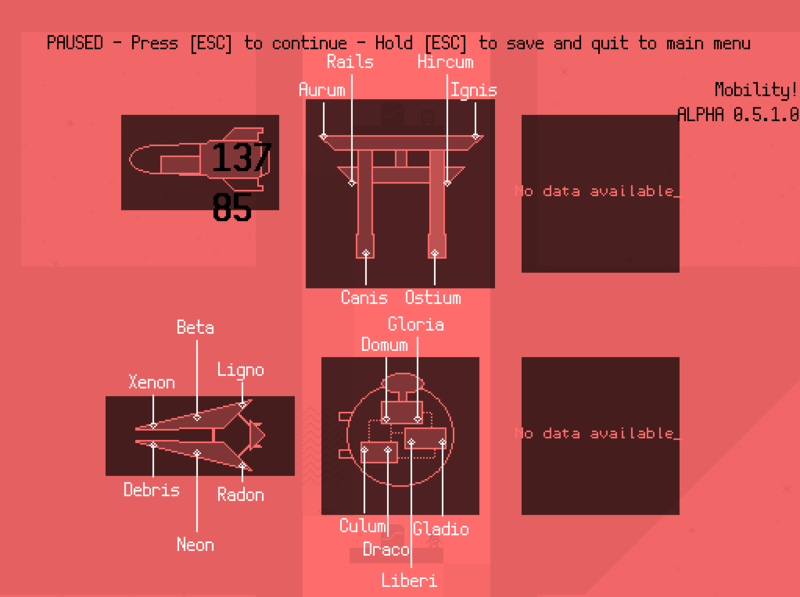 It shows all level names, sorted by the spaceship you can find them in, as well as a summarized completion time. I also included a debug feature which allows me to randomly populate the highscores to see if this menu can handle it. 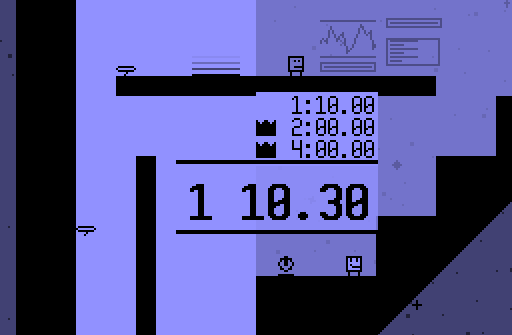 There are some things I do not yet like about it, like the calculation of the 'Total' time, which takes the time from the highest difficulty you beat a level on, and then adds those times of all levels together. So I want to introduce some kind of time penalty for that, but I'm not really sure how that's going to work yet. And I've also given the minimaps a slight facelift. Every map is aligned neatly now. Spacing could still use a bit of work. I've removed the time from this overview, but since you can open the score overview with just a single button press from here, you can use that instead. The white colors on the lines and text work better on dark backgrounds, but lesser on white backgrounds, so I'm thinking of making the label white or black depending on how dark the background is. I've also been implementing a feature where players can submit feedback to me while still in the game. I need the feedback, because I want to make this my best freaking game ever. Here it is, really simple, and not really polished, but it's functionality is sufficient. It also sends a few bits of metadata like the date, version number, which difficulties/modes the player has been playing and his cumulative amount of time. I'm planning to make it pop up after completing the first world in the game in the alpha version of the game I'm sending to testers soon. Finally, I released a blog post recently about making your UI flow as silky smooth as possible, and I'm using Mobility as an example of how I have done it and why. I'll likely go more in depth on this in the future. Here are some new things I've been working on. Might seem a bit little, but I've been busy with other stuff as well-- including Zelda. Enjoy! This will sadly only work in the Windows version, but it works wonders. You can also remap the controller just like the keypad, or disable it and use joy2key instead. Not only that, but there's also the issue that the state of a joystick button can change in the middle of the step. So the game could think a button is pressed in the beginning of the step, yet when checking later near the end of the step, the button seems to have been unpressed. My replay recording system did not account for this, which caused it to break. To top it off, I had to write my own alternative of io_clear to work with controllers as well. I normally use io_clear when opening a menu, it makes sure that the same button press can't both open the menu and select an item on that menu in the same frame. There's no equivalent for io_clear for joysticks, so I implemented it into my own button pressed & released system. Recently, I started a playtesting group and had some of my friends and peers join in. 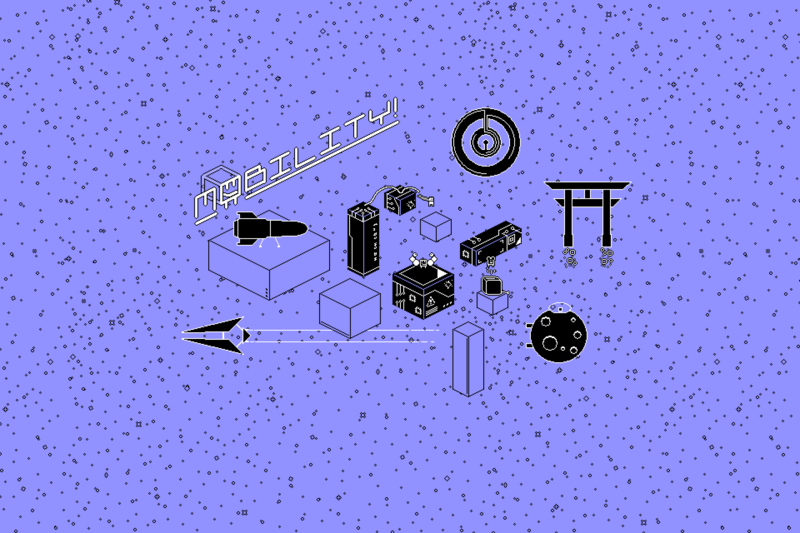 Recently, I sent out a build of Mobility via there. For playtesting, I ask players to set up OBS to record gameplay footage, record their playthrough, then using WeTransfer to get the video file back to me. I've been watching a lot of GDC talks lately, and one that jumped out was a talk from Adriaan, who made Hidden Folks, explaining his playtesting procedures (http://www.gdcvault.com/play/1024132/Playtesting-A...). A lot of points hit home for me, in particular watching people play instead of making them, say, fill out large forms, or instead of taking their suggestions literally, took at the reason why they're giving that feedback and solve the core issue. There are quite a few points of interest these tests brought up. Like, everyone immediately understands that you have to activate all blocks to complete the level, with little explanation. It also clearly shows the less effective things, like players not knowing they can do certain actions they need in the later levels of the game, like long jumping, restarting, or opening the map. 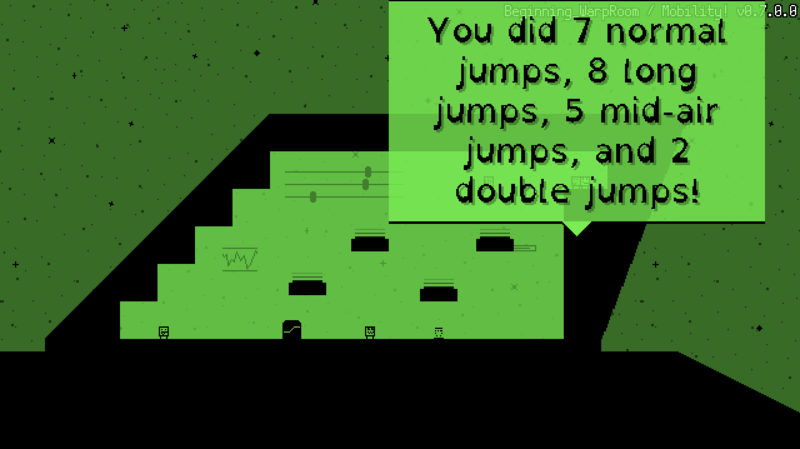 To counter this particular problem, I redesigned the tutorial to explain the extra jumps you can do. It now explains backflipping, long jumping, and double jumping up front. I explain these by drawing arrows showing off the intended movement that the player should mirror to pull it off. Some other rooms on the same ship have also gotten a light redesign. And this is the stuff I'll be focusing on in the coming weeks or so. Slowly but surely I'm beginning to see the end of this game's development! The most important bit of work left to do is to create the last world of the game. My past games didn't really work towards an epic climax, so I'm planning to amend that with this game. I really want to have a nice trailer for Mobility. The current plan is to create a little teaser trailer sometime soon, then make the full trailer once the game's near finished. I've created one other trailer for my games so far: Hexaria. Looking back to it, it's kinda bad. It doesn't really have clear goal the trailer tries to show, and doesn't explain gameplay well enough to interest people. I'm planning to invest a lot of time on this, and I'm planning to make the teaser once I've included some small fixes. I'm planning to add a little achievement system in for players who completed the game and would like to invest some extra time into getting better and higher scores. The way I'm conceiving it now is that players can 'overclock' spaceships, where your score on all levels on the ship is combined into a cumulative counter and you need to bring that down to make the spaceship faster. And maybe, if you do well enough, you can unlock an extra difficult bonus challenge! 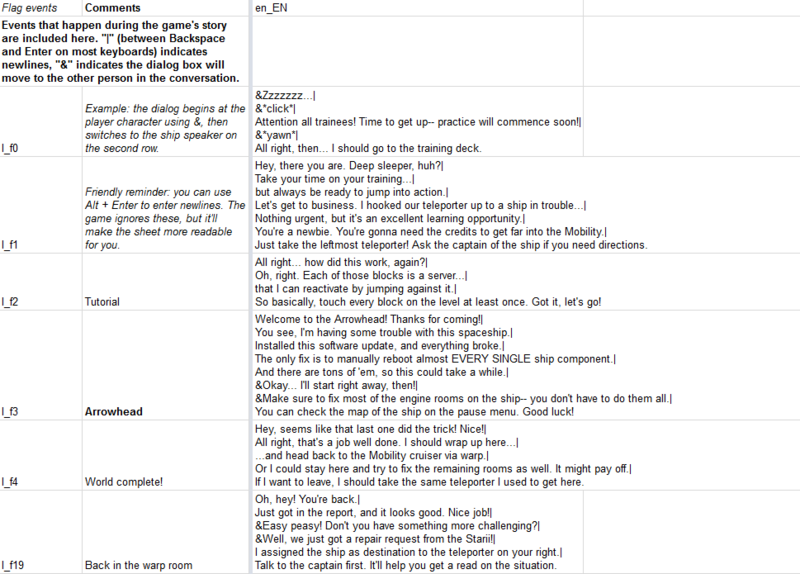 Since itch.io added support for devlogs, I'm looking to convert this thread to a devlog. But until I've figured that out, here's a good old community devlog post! Multiple testers ran into this problem, so I tweaked it so it feels more natural to use. Once you landed on the grind rails, you could no longer steer yourself, but you could gain speed by crouching when going down, or jump of and gain air control. That appeared to be unintuitive for my testers, so now I'm allowing players to control their speed directly by pressing left and right. You still have less control compared to walking, but it's better. Another thing is that the game allows players to jump for a short while after falling off a platform. I disabled that on grind rails, because it would allow players to do a special jump (long jump, backflip) shortly after falling off. However, it was a noticeable user experience flaw, so I fixed that as well. Now, jumping off the tip of a grind rail is significantly more satisfying. Also, boosters now also work properly, allowing the player to achieve ridiculous speeds in some levels! When thinking about making a trailer for Mobility, I was thinking of making the audio a bit more impressive. 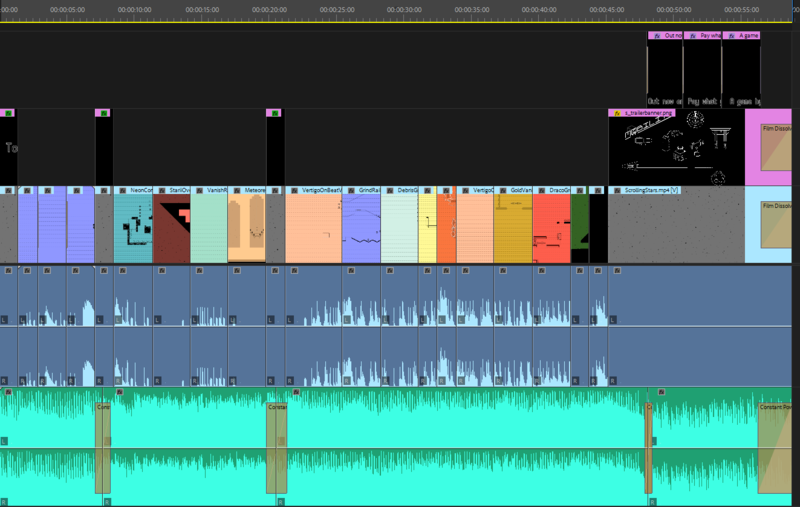 Thus, I added some extra sound effects! Now there's a little pop when you activate a platform, a sound effect that plays when you complete playing a level, and when a block vanishes in the highest difficulty of the game. Now I'm not really sure whether the game has too much sound effects playing at the same time, overloading the soundscape. A tool I'm using to prevent sounds from getting too stale, is changing the pitch of the effect each time it plays. That works pretty well, but if I add any more sounds I need to find an extra way to prevent audio from getting annoying. If you want an example, here's when an error with the sound with the default Windows 'Ding' sound played in various pitches instead of the intended sound effect. I've redesigned the difficulty selection a few times in the development of the game, and now I had to do it again so I could include leaderboards. If I really want to allow for a competitive experience, the leaderboards need to be presented as up-front as possible. In most highscore chasing games, you need to go into another menu to display the scores which I think makes it pretty hard for players to have a clear view of the scores. Similarly, I think just displaying the top 10 scores doesn't show enough about what's happening on the leaderboards. I'd rather have a more complete overview, so I'm using the Fibonacci sequence to show ten score points from all across the top 100 to give a better impression of the entire leaderboard. 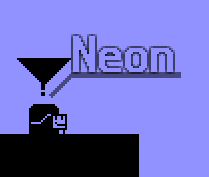 I'm not yet sure whether this is comfy once I start integrating it with the GameJolt API, but I'm keeping it for now. Previously, you selected your preferred difficulty before the level loaded. Now, you do it when you're already inside the level, to allow you to hover over the leaderboard and look at the replays in the list! It's a pretty neat feature that I might expand later to allow ghost races or something. Just a heads up that I'll also be keeping the devlog on it's dedicated itch.io page! If that's more comfy to follow for you, go for it. I'll also be keeping this thread up to date to make sure that, when development on this game is finished, this thread becomes the most complete development documentation for any game I've developed thus far. Thanks for staying with me thus far, and let's complete this game-- the finish line is slowly but surely coming in sight! Since this game uses both very light and dark background colors, and interface elements in this game are often either partially or entirely transparent, it can be quite difficult to put text on the screen that looks nice with both light and dark backgrounds. This made some text quite hard to read in some circumstances. I already tried things like text shadows and changing the text color depending on the background color, but those were only ban-aid solutions, really. Then, I got the idea to try text outlines. This is a good way to combat the contrast problem, since if you aren't able to see the outline, you are able to see the text inside it, and vice versa. 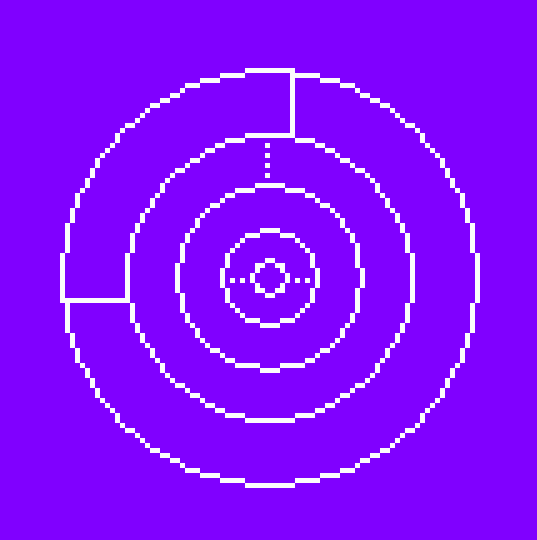 The problem is that Game Maker doesn't support text outline out of the box, so I made a script that draws the text eight times, each time offsetting it by a single pixel from the origin point on both the x and y axis. It looks strange if used by itself, but by drawing the normal text on top of that, we get the intended effect. It also fits really well with the very little colors that the game uses. I had one particular playtest where the player avoided the checkpoints. Curiously, I asked why. The conclusion was that they compared them to the circle saws, the main hazard in this game, and saw the (round) checkpoints as a similar obstacle. For those unfamiliar, this is called a false affordance: basically, it means that an object or function is different that what the player thinks it's intended for. This is because the shape doesn't obviously imply the function, or in this case, the users compare something that they saw earlier. This can create quite troubling situations that can significantly impact player feel: in this case, the player missed the checkpoints, making the game significantly more difficult. So to make a long story short-- checkpoints are diamond-shaped now. I haven't tested it it solves the issue, but I hope it's better than before. I also added a sound effect that plays when it activates, so now almost every important action in the game has an accompanying sound effect. Not sure if I'm overdoing it with the rotating spaceships on the background, but it looks pretty cool. We're putting together the last spaceship of the game together currently! I bet I'll have some pics for that next time. See ya! The most prominent thing I've been doing since last time is making the final boss! But first, let's talk about the final ship in the game. 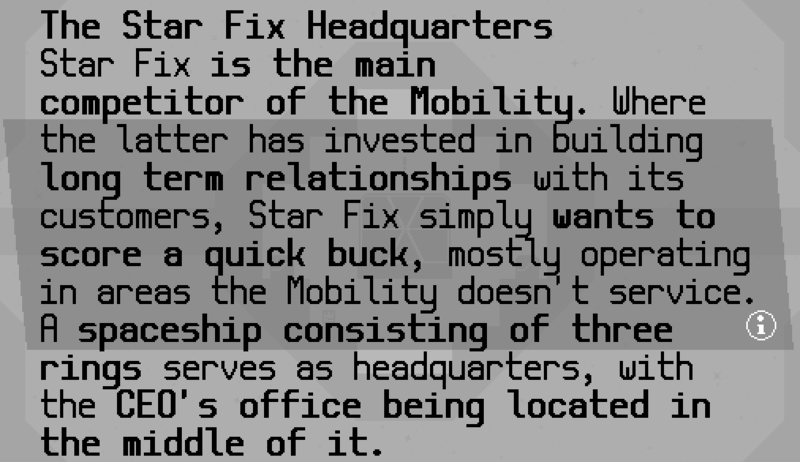 So basically the Star Fix (by far the best/worst pun we've come up with yet) is an evil, greedy corporation, and they're also competing with the Mobility. I'm sure there's a good reason you would want to travel here during your training, right? I can at least tell you that you're going there to defeat a boss! Here are a few reasons why I've never created a boss before! - It takes a bunch of time to create and polish such a boss. Time you could've spent on actually making the rest of the game, which more players are likely to experience, more fun. - If you're making a game where your character has no access to any offensive moves (read: most of my past games), actually battling a boss becomes kinda hard. You need to create new mechanics in order to make that work. Introducing new mechanics at a final boss is a no go for several reasons. - You need to make a bunch of moves for that boss that feel fair, don't glitch the game out and can also be changed up so the boss becomes harder to damage the closer it is to defeat. - I just want to try it out at least once. I've got good base ingredients to make a boss with this set of mechanics. - Most of my previous games kinda ended with an anticlimax (e.g. without warning, the game is suddenly over). Since this game has a little amount of story, I do want to wrap it up nicely by building up to the climax nicely. So let's make a final boss! It looks like the main character, but it's a lot bigger, black and also a robot. So the boss is basically a moving platform. It has some arms that snap to its body. The arms are deadly, and you need to avoid them to reach the robot and touch to deactivate it, like most other platforms from the game. Then, it'll reactivate itself a couple of times until it's defeated. You can touch its body (I think I'll replace the big arms with circle saws later) to deal damage to it. Which means that, most of the time, you will be jumping on its head for damage. There were a lot of funny accidents while programming the boss. I even made a little ARMS clone by accident! That's it for now, but you will definitely see more shenanigans from our little big robot friend. are unlockable, the other two characters will be implemented later. trouble for me to implement. This had three big benefits: - I now know how many strings, words and characters the game contains, and judge how much work it would be to translate the game in another language. - I can use spellcheck to fix the last few typos that remain in the game's story dialog. (I found three of them, so it was totally worth it.) - All of the game's text is in one place that can easily be searched and then exported to a format the game can read. will this game cost? and if it will how much? I'm not putting the game behind a paywall to make it as accessible as possible. I am enabling pay-what-you-want, though, so players are still heavily encouraged to make a donation, because I put in a lot of work (most of my free time from the past two years) and would appreciate it if people sustained the effort. I'm looking into providing some kind of goodie for players that donate, but no details on that yet. Luke Steinmann made some fantastic music for this game, and it even supports soundtrack switching! You can grab it on https://lukesteinmann.bandcamp.com/releases as a pay-what-you-want soundtrack. It was so great to read all of the progress you made with this! Thanks for sharing your thoughts.